Lettie the SuperDog (TM) doing what she does best. 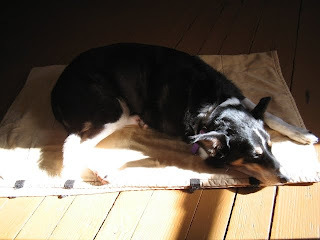 When we lived in Philadelphia, she'd find a square of sunlight and plop down no matter the temperature outside. I swear she's solar powered. I liked this pic, decided to share a picture of my constant companion. She's been with me for almost 8 of her 9 years and we haven't looked back. In fact she's better in the car than most people I know! Amazing when I think that she was a shelter dog who was abandoned at 6 months, stayed there for a year before I found her and took her into my life. Border Collies and Mc Nab Dogs are incredibly intelligent, require a "Soft Hand" and are one of the most frequently abandoned dog breeds as a result. People don't have a clue what it means to raise an intelligent dog. I guess I lucked out. We had some stumbles along the way but I wouldn't trade her for the world.